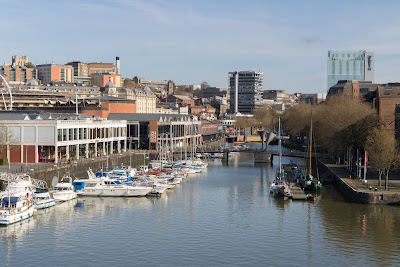 This year's BQIT workshop was hosted at the M Shed on Bristol's harbourside. 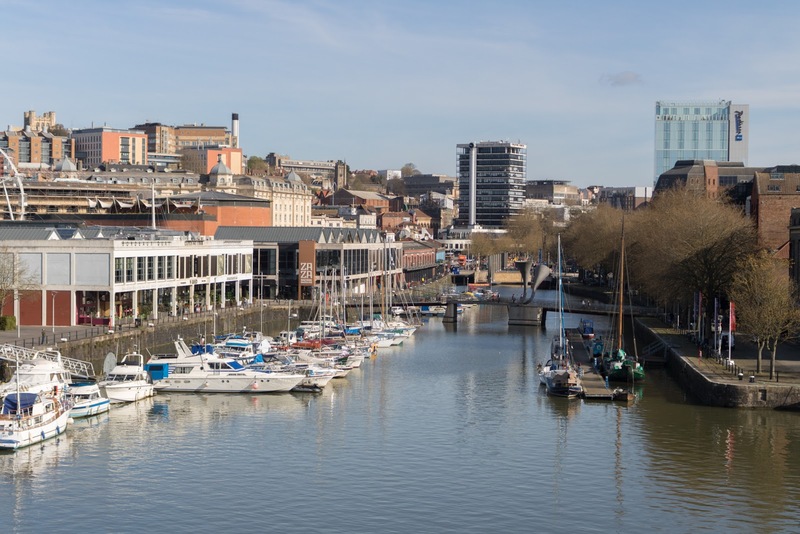 The first day of QET Labs' fourth annual Bristol Quantum Information Technologies (BQIT) Workshop kicked off with a whistle-stop tour of quantum technologies, ranging from the foundations of entanglement to the quantum industry. For entanglement foundations, first to speak was University of Toronto's Aephraim Steinberg, highlighting two recent results: how quantum-enhanced sensing can beat "Rayleigh's curse" and strongly increase nonlinear optical effects. 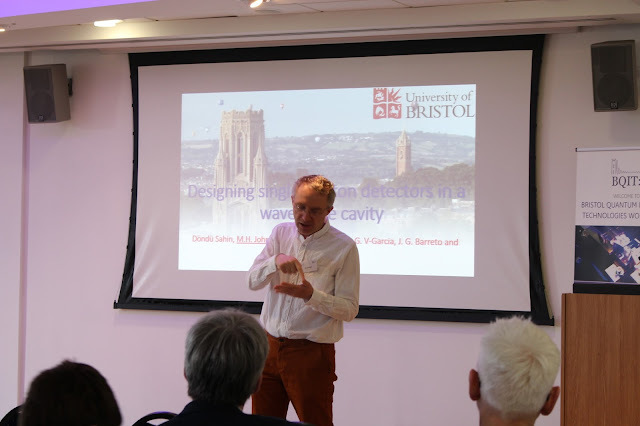 He was followed by Marek Żukowski from the University of Gdańsk, who explained how redefining Stokes parameters can lead to better entanglement observations. The devices segment began with Josh Nunn from the University of Oxford unveiling a long awaited result: A noise free quantum memory! University of Pavia's Marco Liscidini followed this with his proposal for a ring resonator with 99.9% purity. Our first information theorist of the workshop, Caltech's Elizabeth Crosson spoke about not only how quantum annealing can outperform simulated annealing, but even how classical techniques inspired by quantum annealing can provide speedups over simulated annealing. Following lunch, Jake Kennard of QET Labs started by speaking about quantum cryptography in integrated silicon, focusing in particular on a secret key rate of 1megabit/s from a chip smaller than a 5p coin! 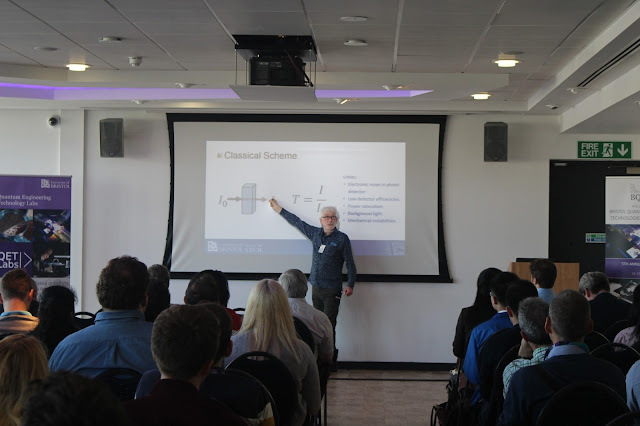 Robert Collins from Heriot Watt University explained recent work on implementing quantum digital signatures on kilometre networks around the world. The communications segment concluded with the Russian Quantum Centre's Yury Kurochkin explaining their proposed products for commercial quantum key distribution. Chris Erven, deputy director of the Quantum Technology Enterprise Centre (QTEC), began our industry segment by talking about the past year of QTEC and his advocacy for "white-hat tweeting". 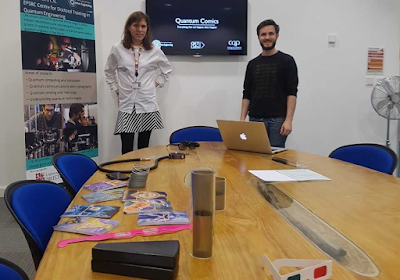 From a fundamental company for quantum photonics, Chris Snelling of ICE Oxford detailed the largest and most powerful cryostat they have ever made, offering 340mW of colling power at 1.0K. Our final talk for the day came from Keysight Technologies' Niki Haines, who explained the platforms Keysight thought were most likely to mainstream quantum computers, and the tools they were developing to help reach this goal. 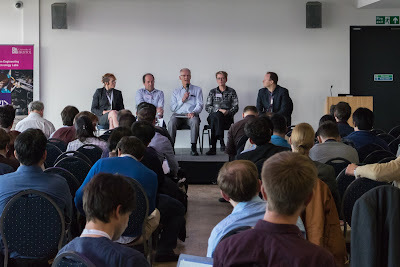 The day concluded with a panel discussion on the state of the quantum industry. Questions ranged from how the industry has (and will continue to) change, to what academics and universities should do to enter the commercial world, and what would the panellists consider to be quantum technology in the first place. Our Industry panel (left to right) Susannah Jones from DSTL, Roberto Desimone from BAE Systems, Bob Cockshott from KTN UK, Niki Haines from Keysight and Andy Collins from QTEC.